Xavier University, 3800 Victory Parkway, Logan Hall, Room 100: “Illuminating the Dark: The Poetry & Poetics of Tuvia Ruebner” Back will give a talk on the poetry and poetics of pre-eminent Hebrew poet Tuvia Ruebner – poetic peer of Yehuda Amichai and Dan Pagis, literary executor and lifelong friend of Lea Goldberg, award-winning translator of Agnon and others. Back’s lecture will track the central tenets of Ruebner’s poetry and his unique trajectory from being a voice of the Holocaust generation to becoming also a poet of protest. Locating her words within the difficult reality of the Middle East, Back will discuss the fashion in which Ruebner’s poetry offers an alternative perspective on historical and personal losses, asserting a life-affirming force from out of the devastation of the twentieth century, into the twenty first. Hebrew Union College-Jewish Institute of Religion, 3101 Clifton Avenue, Mayerson Hall: “Illuminating the Dark: The Poetry & Poetics of Tuvia Ruebner” Back will give a talk on the poetry and poetics of pre-eminent Hebrew poet Tuvia Ruebner – poetic peer of Yehuda Amichai and Dan Pagis, literary executor and lifelong friend of Lea Goldberg, award-winning translator of Agnon and others. Back’s lecture will track the central tenets of Ruebner’s poetry and his unique trajectory from being a voice of the Holocaust generation to becoming also a poet of protest. Locating her words within the difficult reality of the Middle East, Back will discuss the fashion in which Ruebner’s poetry offers an alternative perspective on historical and personal losses, asserting a life-affirming force from out of the devastation of the twentieth century, into the twenty first. Rachel Tzvia Back lives in the Galilee, where her great great great grandfather settled in the 1830s. She has lectured widely in the United States and is the recipient of various awards, including a PEN Translation grant, a Hadassah-Brandeis Research grant, and a Dora Maar Brown Foundation Fellowship. Previous volumes of translation include Lea Goldberg: Selected Poetry and Drama and With an Iron Pen: Twenty Years of Hebrew Protest Poetry. Her own poetry collection A Messenger Comes (Elegies) was voted by Forward Magazine one of the five most notable poetry collections of 2012. 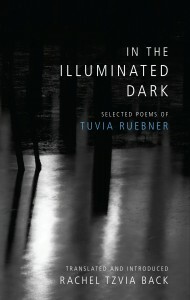 Her most recent publication is In the Illuminated Dark: Selected Poems of Tuvia Ruebner (Hebrew Union College Press and the University of Pittsburgh Press), the first volume of Ruebner’s poetry to appear in English.